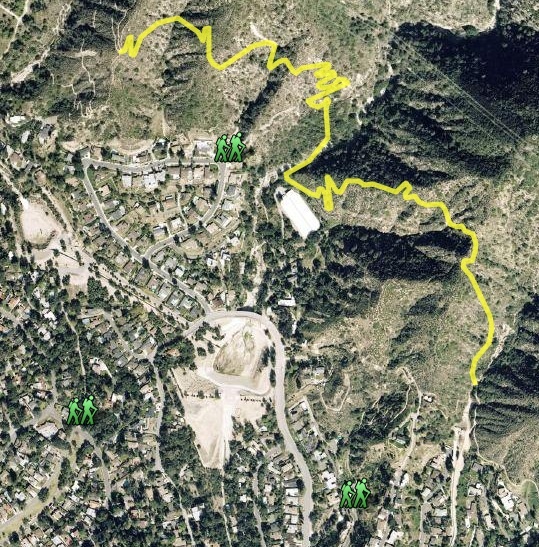 I have started a Google Maps version of the Altadena Crest Trail. I am transcribing it from the map published in a flier that was snail-mailed out by LA County several months ago (map is dated 2-1-05). So far my Google version only has the trail heads and the proposed Rubio Canyon Gap segments. I'll work on the proposed Skylane Gap and LaVina sections next (the proposed sections are more time consuming because there is no existing trail to trace). After I get my best shot at those in, I'll trace the exiting trails and access paths as well. This is really fun, because with the Google satellite and hybrid views, you can inspect the route in tons more detail than you can with the printed maps that I have seen. On a related note (in case you hadn't noticed), the satellite images of our area have been recently updated (looks like maybe this past winter). While we already had hi-res imagery of the populated areas, it was a bit long in the tooth (recent construction changes were not reflected). More to the point, the new images include the mountains as well. Perfect for mapping the hiking trails! morning, so on bed rest...thank god for laptops and wireless internet). FYI I have marked the ones "proposed" based on the documents I could access. people who did the surveys are proposing them as their favorite ones?